We’d love your help. Let us know what’s wrong with this preview of With The Night Mail by Rudyard Kipling. "SHE: Do you like Kipling? HE: I don't know, I've never Kippled!" If you've never read Rudyard Kipling's science fiction, then you've never Kippled. 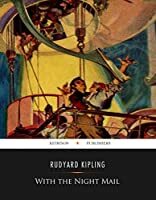 Having achieved international fame with The Jungle Book, Captains Courageous, Kim, and his Just So Stories, in 1905 Kipling serialized a thrilling science fiction novella, With the Night Mail: A Story of 2000 A.D, in which the "SHE: Do you like Kipling? HE: I don't know, I've never Kippled!" If you've never read Rudyard Kipling's science fiction, then you've never Kippled. Having achieved international fame with The Jungle Book, Captains Courageous, Kim, and his Just So Stories, in 1905 Kipling serialized a thrilling science fiction novella, With the Night Mail: A Story of 2000 A.D, in which the reader learns — while following the exploits of an intercontinental mail dirigible battling foul weather — about a planet-wide Aerial Board of Control, which enforces a rigid system of command and control not only in the skies (which are increasingly crowded with every manner of zeppelin) but in world affairs too. Kipling got so excited by his own utopian vision that when the story first appeared in McClure's Magazine, it was accompanied by phony advertisements for dirigible and aeronautical products that he'd written, plus other ersatz magazine clippings. In one of these latter, we read that the Aerial Board of Control had effectively outlawed war in 1967 — by "reserving to every nation the right of waging war so long as it does not interfere with traffic and all that that implies." This turns out to imply a great deal! In Kipling's 1912 followup story, "As Easy As A.B.C.," which is set 65 years after With the Night Mail, we learn just how complete the Aerial Board's control is over the social and economic affairs of every nation. When a mob of disgruntled "Serviles" in the District of Northern Illinois demands the return of democracy, the A.B.C. sends a team of troubleshooters (from England, Russia, Japan, and Italy) and a fleet of 200 zeppelins to "take such steps as might be necessary for the resumption of traffic and all that that implies." Democracy, it seems, is an impediment to the smooth flow of international commerce — so it was abolished during the 20th century, along with newspapers. 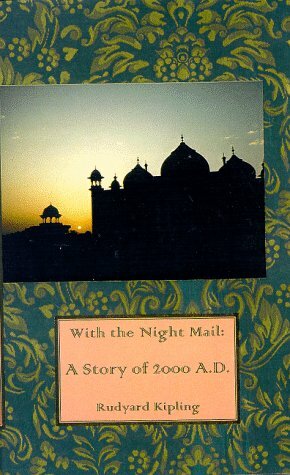 To ask other readers questions about With The Night Mail, please sign up. Even though Kipling’s idea of the year 2000AD falls short of reality, I still found this story entertaining, very fast paced and energetic. It is the first of only 2 science fiction novels he wrote, the second being the sequel, As Easy as A.B.C.. I never thought of Rudyard Kipling writing pulp science fiction but here is the proof of at least one venture into such territory. Written in 1905, this story was great fun to read and I hope someday to find the sequel that was written in 1912 and takes place 60 years or so after the action in Night Mail, which was set in the year 2000. I was tickled by many of the details in this story, which follows a dirigible mail ship across the Atlantic. There is a lot...A LOT...of air traffic, all controll I never thought of Rudyard Kipling writing pulp science fiction but here is the proof of at least one venture into such territory. Written in 1905, this story was great fun to read and I hope someday to find the sequel that was written in 1912 and takes place 60 years or so after the action in Night Mail, which was set in the year 2000. I was tickled by many of the details in this story, which follows a dirigible mail ship across the Atlantic. There is a lot...A LOT...of air traffic, all controlled by the 'Aërial Board of Control', which pretty much is responsible for running the entire planet. I loved the idea of these ultra-modern mail 'plane' dirigibles carrying crews of clerks sorting bags of what we call Snail Mail during the journey. There are light beams that function just like old-time lighthouses to direct traffic, but the beams point straight up into the air. My favorite is the strongest, highest-reaching one, with its green light visible for miles...it is known as The Leek. In less than 60 pages of actual story, Kipling created the base for what could have been a fascinating series of tales, and he made this particular one even more fun by writing 'bulletins' from the A. B. C. at the end, as well as 'answers' to correspondents who had written to the A.B.C. to complain about various things encountered in their journeys. One example is this reply to 'Beginner': On still days the air above a large inhabited city being slightly warmer—i. e., thinner—than the atmosphere of the surrounding country, a plane drops a little on entering the rarefied area, precisely as a ship sinks a little in fresh water. Hence the phenomena of "jolt" and your "inexplicable collisions" with factory chimneys. In air, as on earth, it is safest to fly high. Kipling even includes a review of a book written about one of the pioneers of this fantasy world's exploring era. Now, I knew the book was not real, but by the end of the review, I wanted very much to read that book! Not to mention the rest of the review, which ended with those dreaded words "To Be Continued". ¶ TO-DAY none of the Planet's freight is carried en plane. ¶ Less than two per cent. of the Planet's passengers are carried en plane. The story is thinner than air, but it’s really about the worldbuilding, which is amazing. This tale features large dirigibles moving passengers and freight across the planet, the use of radios, and the slagging off of aeroplanes. Bear in mind that this was published in 1905, before zeppelins existed, before successful demonstrations of radio, and just after the Wright brothers demonstrated their airplane. The Wrights were widely disbelieved and dismissed, despite numerous flights before witnesses from the government and press, not to mention photos. Kipling is clearly in the “airplanes are preposterous deathtraps” camp. This is the equivalent of A Logic Named Joe by Murray Leinster from 1946, where Leinster accurately portrayed the modern internet before TV was a thing. Sure, many of the terms aren’t the same as what we ultimately settled on, but the concepts are all there. The second half of this is comprised of an imagined technical journal/magazine based on airship travel. Kipling has written an aerial version of the Shipping News, a racing report, book reviews and book catalogs, and even made-up ads for parts and jobs. Kipling went deep on this. It’s kind of a shame he didn’t write a more compelling story to go along with it, instead focusing on the nuts and bolts of how mail delivery by airship works. Kipling did waaay overestimate how fast dirigibles would be able to travel, but since they didn’t exist in their giant form yet, I’m cutting him some slack. Count von Zeppelin only built his first (small) rigid airship in 1900. I mean, come on. That’s badass. This story is a quick read, but not a particularly engaging one-- aside from the curious fact that it's a sci-fi story written by Rudyard Kipling, who is not normally associated with the genre. The story itself is an account of a fairly routine zeppelin-mail delivery (London to Montreal) that happens to be set in the year 2000. The characters are forgetttable, and a lot of the story involves technobabble about the "Fleury ray" that makes dirigible travel so effective. What's really interesting i This story is a quick read, but not a particularly engaging one-- aside from the curious fact that it's a sci-fi story written by Rudyard Kipling, who is not normally associated with the genre. Remarkable writing. Thorough, fully created alternative world. Done as if it were all real and done well. No plot to speak of nor characters. A look into the future from more than a century ago. Kipling got just about everything wrong, mostly by underestimating the advances and the resulting social change. Still, a very interesting set of ideas. More strictly a novelette, With the Night Mail comes in at only 13,000 words and 60-ish pages. I started out with a download from the Gutenberg project (it’s well into the public domain) but found a beautiful scan of an illustrated version on Forgotten Futures linked from Wikipedia which also includes “As Easy as A.B.C.”, a shorter tale set in the same universe. Together, the two make up the only Science Fiction Kipling published. The online version of the Gutenberg text includes the illustratio More strictly a novelette, With the Night Mail comes in at only 13,000 words and 60-ish pages. I started out with a download from the Gutenberg project (it’s well into the public domain) but found a beautiful scan of an illustrated version on Forgotten Futures linked from Wikipedia which also includes “As Easy as A.B.C.”, a shorter tale set in the same universe. Together, the two make up the only Science Fiction Kipling published. The online version of the Gutenberg text includes the illustrations, too, but I picked the wrong download originally. Seemed for a while that it was just going to be a story touring the modern airship of the year 2000. This part of With the Night Mail was intellectually interesting but I was waiting for an actual story to start. This part does establish the dirigible/air ship as the preferred method of transportation and freight in the world. This is emphasized throughout the story with a variety of other points. Kipling knew about planes, or at least the idea of them, but in the world of the A.B.C., they never took off. Air ships and submersibles take care of everything. The narrator is more of an observer, reporting on the various deeds and heroics of the senior and junior captains of “Postal Packet 162”. During the story, we learn the layout and functioning of 162, the habits of her captains, and details of what makes the world work. We watch them deal with normal daily events on a postal packet as well as both the rescue of a crew from a doomed private dirigible and a truly nasty storm that could have ended everything for the crew of the 162. The writing and the world aesthetic fits right in with modern steampunk, and it’s better than most of what I’ve read in that subgenre. But it’s important to remember that it isn’t steampunk, or wasn’t at the time, but actual SF, and it does make predictions beyond the specific airship technology, although those particular predictions mark it as more alternate history now. But Kipling also suggested in the story that war would be a thing of the past by the year 2000, scientific advancements would improve our lives, and those lives would be extended to thirty years or more beyond the average of his time. While the latter two have proven basically correct, if not quite in the same ways Kipling foresaw, the first still seems like a distant dream. And the science and engineering of what made the airship the method of choice, if made up, is a plausible extension of what Kipling might have been expected to know as a well educated man in 1905. There was a moment, just after a rescue, where it looked like Kipling might be making a prediction on the future of religion, how “men of the old days” had been taught “that after death he would very possibly go for ever to unspeakable torment”. But another moment later in the in the story puts a different spin on things. The 162 passes a hospital ship signing to the glory of god in the morning, and the crew of the postal ship joins in, so it’s only hell that’s been forgotten as a serious thing and not religion as a whole. I wish I had some idea of Kipling’s religious views because the idea is an interesting one and I think is a throwback to an earlier version of Christianity. The story itself is only two thirds of the pages, though it does make up most of the text. The remaining pages consist of what I’d call world-building notes: log entries, dispatches from the ABC, and notes that tell bits of the story of the world the Aerial Board of Control more or less governs. Somehow, it’s become the glue that holds the world together by the year 2000, probably a fair distance in time before, with only Crete as, until recently, a hold out. All of this comes under the heading of “Aerial Board of Control Bulletin”, which I think we’re to gather is a weekly update. It’s interesting world building, but not strictly necessary to the story itself. It’s fun, though, complete with letters to the editor, a review of an imaginary biography, want ads, and regular ads. Not so very long ago I was surprised to discover that Mark Twain wrote a spoof Sherlock Holmes story called The Double-barrelled Detective Story. Lo and behold, now I find out that Rudyard Kipling wrote a sci-fi tale. Whatever next? Did Jane Austen write a swashbuckling adventure yarn? I no doubt should have known these things a long time ago, but there you go. Twain's quirky little diversion was well worth discovering. How about Kipling's unlikely foray? According to Kipling, in the year 2000 we Not so very long ago I was surprised to discover that Mark Twain wrote a spoof Sherlock Holmes story called The Double-barrelled Detective Story. Lo and behold, now I find out that Rudyard Kipling wrote a sci-fi tale. According to Kipling, in the year 2000 we all travel the globe in dirigibles because planes never really, pardon the pun, took off. A journalist takes a journey on the London to Quebec 'Postal Packet 162' and just about lives to tell the tale after being caught up in an electrical storm. The dirigibles can climb up to 10,000 feet due to some incomprehensible contraption called the Fleury Ray, although I can't think why anyone would want to because the air is so cold you have to wear a silly inflatable suit. Your average pilot fly's like a jerk anyway so if the storms won't get you another dirigible will. Apparently everybody gets on after that without the need of governments, deferring to the Aerial Board of Control ('A.B.C.' for short) in all matters. They regulate the airways as their main task and run the world on the side. First published in 1905, this Rudyard Kipling short story is set in the year 2000. Dirgibles and zepplins of all sorts fill the skies with busy air traffic, overseen by the Aeriable Board of Control (A.B.C.). "Science fiction novels published after the genre’s 1864–1903 Scientific Romance era, but before its (1934–63) so-called Golden Age. The 1904–33 era is one in which sf fans and historians have never been particularly interested." Interesting. Kipling imagined a world in which commerce was dominated by airships. A supra-national agency, the Aerial Board of Control, regulated air commerce and penalized nations for interference with commerce. In this world, airplanes are toys of the wealthy. The problem Kipling had was that his hero is the technology. He shows us the technology, not how the men lived and struggled with the technology. For that reason, it is inferior science fiction. Kipling isn't renowned for his sci-fi and this goes some way towards explaining why. It's well-written, but still reads like some kind of Jane's aeroplane manual for futuristic planes that never existed or aviation magazine. Add to this some dodgy predictions about the future 2000 AD (now known to be way off the mark - including the very first line about the GPO!) and you end up with something that is very humdrum indeed. I got so bored, I gave up after 3/4 of it, despite forcing myself on. An interesting read. The faux science is detailed. In many respects typical Kipling but for me a rather superficial story in the end. I would have liked to see the ideas and the setting further explored in a more lengthy speculative work but a worthwhile read for me nevertheless. Good world building, with an emphasis on creating convincing science but character is superficial. A curiosity piece. I'm kind of scared to read the Jungle Book, having despised this short story so much. The writing style is very dry, packed full of technical details about the airships with nary a plot or character of depth to be seen. I only read this story to help someone with an essay and if I could go back and retrieve that wasted time I would. I had no idea Rudyard Kipling had written science fiction. I also had no idea Rudyard Kipling had written anything this bad. His vision of the year 2000 (as envisioned in 1905) is meticulous, but so crowded with imaginary technical jargon that I still don't know what the story is about. Well, I only understood about one word in five of the technical gobbledegook about the airships, but being Kipling it's immensely readable. And the accompanying material, the job adverts and suchlike, are superb. This is well worth an hour of anybody's time. Interesting as a Victorian steampunky artifact. As an actual story, not so much. Kipling's works of fiction include The Jungle Book (1894), Kim (1901), and many short stories, including The Man Who Would Be King (1888). His poems include Mandalay (1890), Gunga Din (1890), The Gods of the Copybook Headings (1919), The White Man's Burden (1899), and If— (1910). He is regarded as a major innovator in Joseph Rudyard Kipling was a journalist, short-story writer, poet, and novelist.